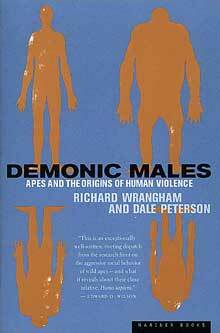 Demonic Males began as a casual cocktail party chat between myself and my friend Richard Wrangham. Wrangham is the Ruth Moore Professor of Biological Anthropology at Harvard University—a very smart guy who, having originally learned about chimpanzees by working at Jane Goodall’s research site in Tanzania, went on to establish his own study site in Uganda. There are only four major wild chimpanzee research sites in the world; he worked at one, and for many years has run a second. He is certainly one of a tiny handful of top chimpanzee behavior experts in the world, and I recommend this book as an expression of his theoretical brilliance. Much of its logic depends upon a comparison of three very closely related ape species—chimpanzees, bonobos, and humans—and an assessment of why two of them (chimps and humans) are unusually violent, while the third (bonobos) is famously peaceful. Demonic Males was designated a Best Book of the Year by the Village Voice, and short-listed for the Winship / PEN New England Award. It has been translated into Chinese, Dutch, German, Italian, Japanese, Korean, Polish, Portuguese, and Spanish. From the show: The Dr. Decker Weiss Show. Original Air Date December 16, 2013. It is a scientifically accepted fact that humans evolved from a common ancestor with chimpanzees, but our similarities and differences are not what many people think. Animal science expert Dale Peterson, PhD, explores the genetic link between the two species and explains the similarities and differences.